I have traveled to most of the forests in India namely the Bandipur Tiger Reserve, Nagarahole National Park, BR Hills, Bhadra Wildlife Sanctuary, Ranthambore National Park, Tadoba Andhari Tiger Reserve and Jim Corrbett. 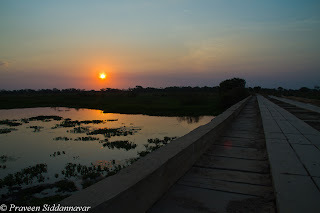 I was wondering what makes Pantanal in Brazil so special that most people around the world travel to South America to visit Pantanal. 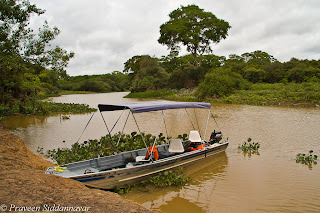 Honestly traveling to Pantanal was never my dream nor in my wish list, it was mere a coincidence I had to travel Brazil on business and this provided me the opportunity to visit Pantanal. Most of us are unaware of this place & invariably Kenya & Tanzania in Africa is the prime focal point in most wildlife destinations. 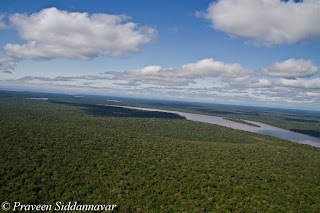 This is one reason why Pantanal is less known and is under severe threat. 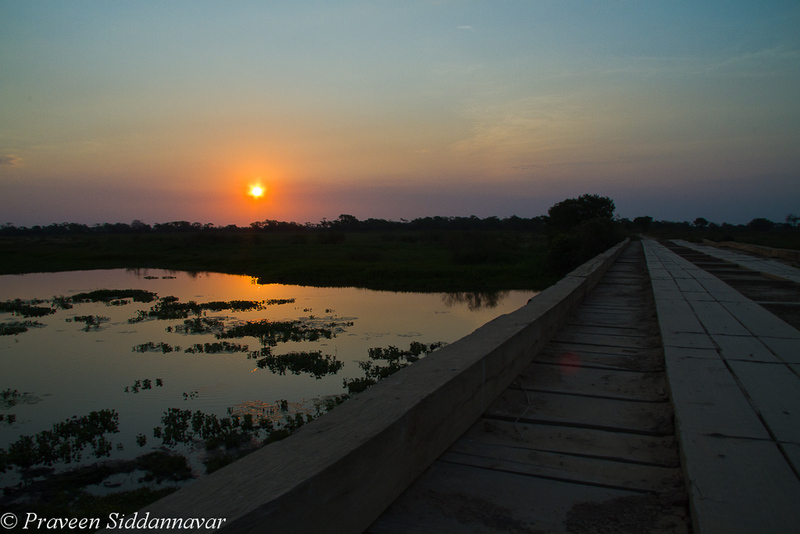 Pantanal is one of the most immense, pristine and biologically rich environments on the planet. Often referred to as the world’s largest wetland system, it extends through millions of hectares of central-western Brazil, eastern Bolivia and eastern Paraguay. 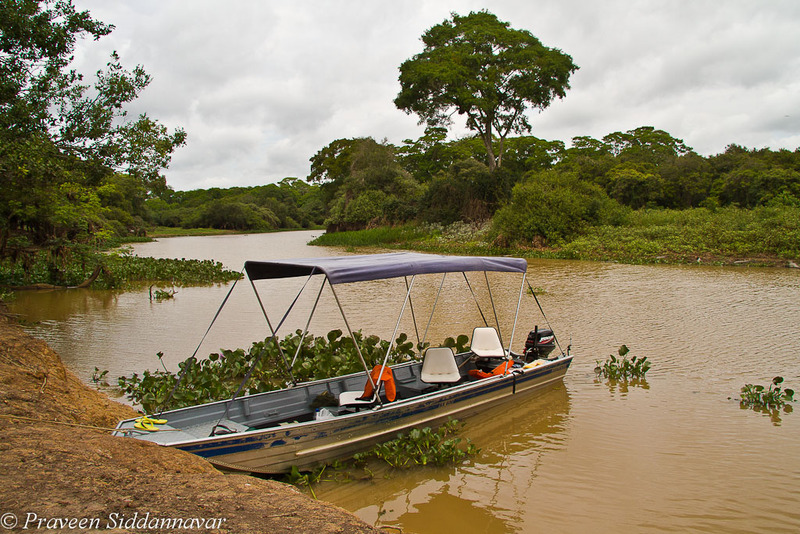 With its extraordinarily concentrated and diverse flora and fauna, and a landscape spanning a variety of ecological sub-regions, the Pantanal stands as one of the world’s great natural wonders. This area is an unparalleled wildlife sanctuary of spectacular beauty, an ecological paradise containing hundreds of species of birds, thousands of varieties of butterflies, myriads of brightly colored flowers, and shoals of fish. Capuchin and Howler monkeys, capybaras, toucans, anacondas, caimans and tapirs help create an aquatic and sylvan theater of sights and sounds. 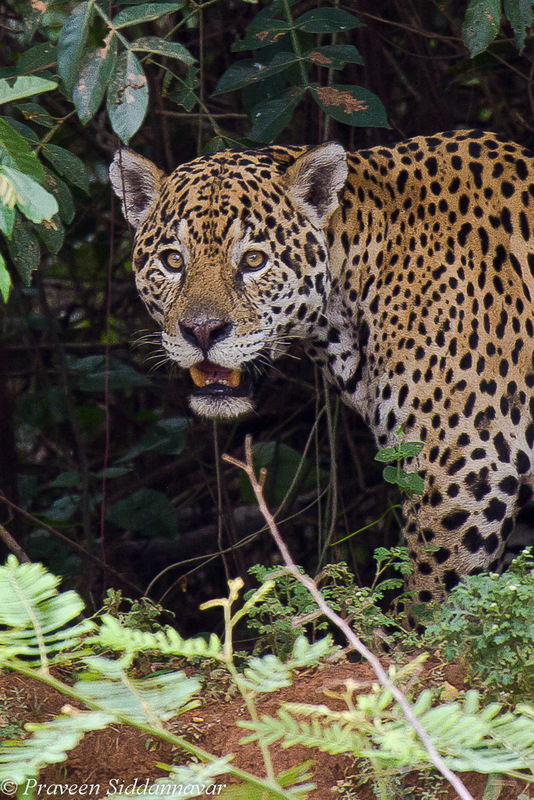 The endangered jaguar, and increasingly rare Hyacinthine macaws and giant river otters, all make their home in the Pantanal. The Pantanal also provides incalculable economic benefits. It offers a huge area for water purification and groundwater discharge and recharge, climate stabilization, water supply, flood abatement, and an extensive, transport system, among numerous other important functions. And yet, despite the region’s beauty and remarkable environmental and economic value, the Pantanal remains poorly unknown and faces an uncertain future stemming from a myriad of socioeconomic pressures. While the Pantanal remains comparatively untouched, without correct understanding, timely action and wise management, its future could be seriously compromised. There have been so many images and stories to share from my Brazil trip; however I am not finding the time to process & compile them. Today finally the time has come to share the most awaited “My Encounters with Jaguar”. 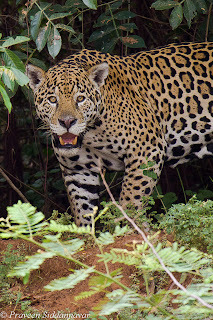 Having seen and photographed plenty of Tigers and Leopards in Indian forests, I was wondering what makes a Jaguar so special that people from all over the world travel to South America especially Pantanal in Brazil to just have a glimpse of this cat. It was Saturday the 24th Sept’11, I was on the boat safari ride and the time was around 12 noon, the boatman and my guide were insisting that we stop for lunch. It is quite obvious we start the day quite early at 5:30am with breakfast and one feels hungry by noon. 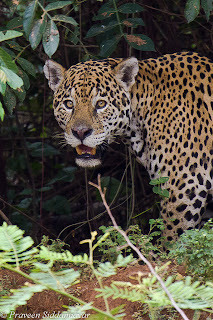 We hadn’t spotted any Jaguars since morning and I knew that I didn’t have all the time in the world, was here for a short stay in Pantanal, I requested that we take another round on the three brothers rivers & then break for lunch. As we were heading towards the three brothers river, suddenly a capybara from the bank that was on our right, jumped into the river. The capybara swam across and started making loud sounds. I told my guide that it’s an alarm call, to my surprise he wasn’t aware what an alarm call is? My experience in Indian forests helped me to understand the situation better. 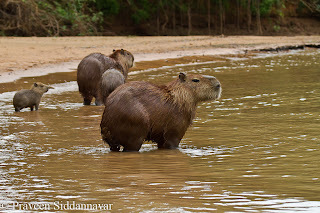 Capybara is the largest living rodent in the world; its main diet is grass and vegetation. They belong to the wild pig family and of course cousins of wild pig. Coincidentally capybaras are the favorite meal for Jaguars, Caimans (Crocodile) & to the dangerous Anacondas. I was 100% sure that the capybara had seen the Jaguar somewhere in the bushes hence the alarm calls. Later this capybara joined a small group of other capybaras who also got cautioned hearing the alarm calls, they all were looking in one direction, as seen in the image. Now my guide and boatman too were convinced that somewhere a Jaguar is hiding. Choku my guide used a powerful binocular and managed to spot the elusive cat. But how can I photograph this cat behind the bushes, sharing the image just that you get an idea how this beauty was nicely camouflaged & hiding. All this while our motor boat engine was switched off, now since we spotted the Jaguar from a distance we had to start the engine to move in closer. The boat movement was in our favor as the Jaguar too started to move behind the bushes on the edge of the river bank. I remember I had only 3 or 4 occasions when he came out partially in the open I took the opportunity to shoot few images. 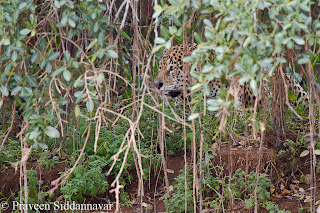 The sighting lasted only for few minutes and the Jaguar again disappeared into the bushes. Believe me it isn’t easy to shoot in a moving boat, but fortunately I managed few decent shots. 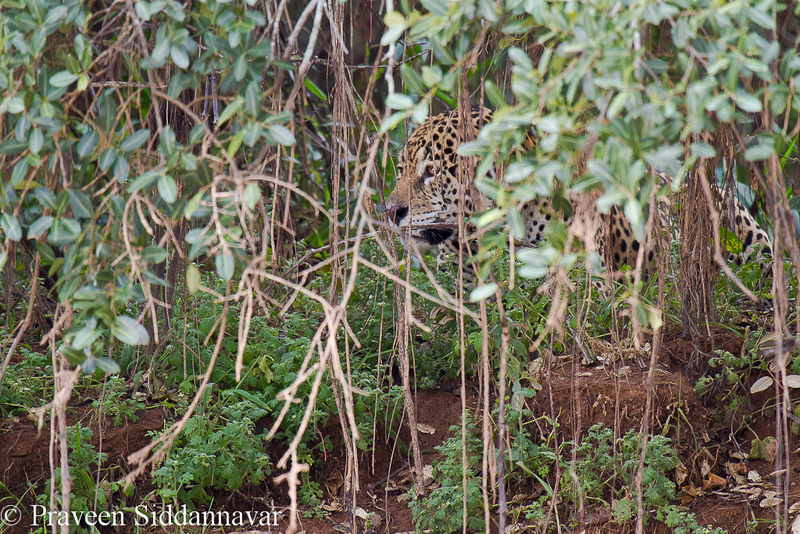 We waited for a while, but with temperature almost ~40 degree Celsius chances of Jaguar coming out were almost nil. Without wasting much time I celebrated this sighting by having a chilled SKOL:), a Brazilian beer and we then proceeded to have our packed lunch. What happens post lunch is very unique and even more interesting, but unfortunately you have to wait for some time. I will share it soon, so stay tuned! How does one differentiate between a Jaguar and a Leopard? 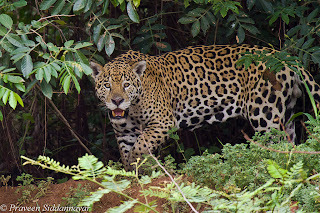 While the Jaguar closely resembles the Leopard, it is sturdier and heavier, and the two animals can be distinguished by their rosettes, the rosettes on a jaguar's coat are larger, fewer in number, usually darker, and have thicker lines and small spots in the middle that the leopard lacks. Jaguars also have rounder heads and shorter, stockier limbs compared to leopards. Unlike other big cats, jaguars kill prey by crushing the spinal column and must have a much stronger bite in order to do so. This means that the shape of their skull is unique among the cat species. As a result, they have the strongest bite-force of any member of the cat family--even stronger than lions and tigers. 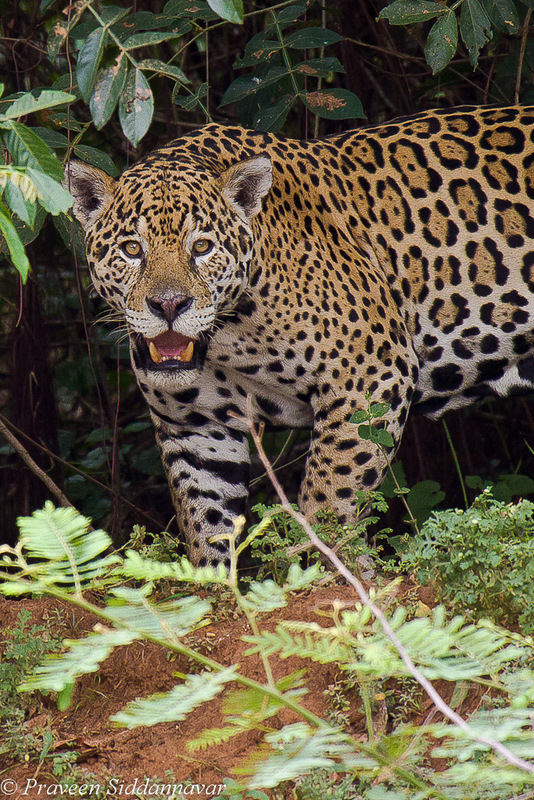 The jaguar weighs twice as much on average than a leopard. A fully grown male jaguar can even weigh up to 160 kilograms almost equivalent to a Tiger. Finally!!! you decided to write something about your Brazil trip! As usual great images and narrations! wow a gr8 experience! n write-up.